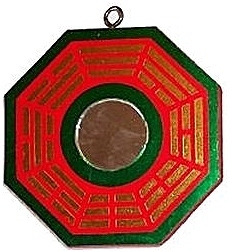 Traditional eight sided Bagua Mirrors are hung outside homes and businesses all over Asia to ward off any evil influences. They are the basic Feng Shui solution for protection and are effective in deflecting harmful chi (negative energy). Hand crafted and painted in China. Feng Shui originated in China over 3,000 years ago. It's primary aim is to improve every aspect of life, including wealth, relationships, health and happiness by creating balance and harmony in the environment. Feng Shui means wind and water. Wind (feng) represents health and water (shui) represents wealth - not only in a financial sense but also wealth of mind, body and spirit.